A Russian Progress supply ship loaded with more than 3 tons of supplies and equipment bound for the International Space Station apparently spun out of control shortly after reaching orbit Tuesday, putting the resupply mission in jeopardy while flight controllers scrambled to come up with a fix. The station's six-member crew was not in any danger and nothing critical to lab operations was on board the Progress. But the loss of more than 6,000 pounds of supplies, if it comes to that, would cut into the lab's on-board reserves, already an issue because of the failure of a U.S. cargo ship last October. 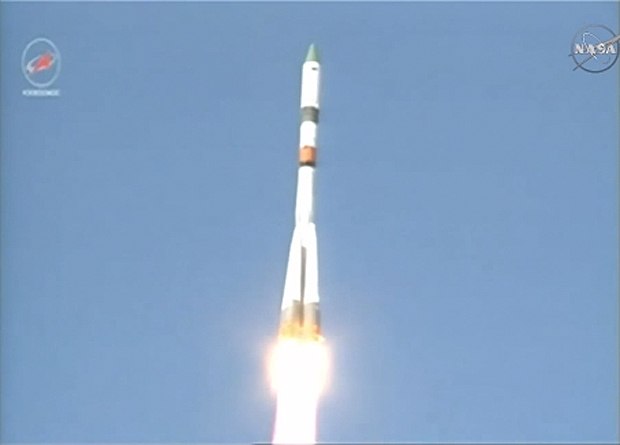 The Progress M-27M/59P spacecraft blasted off from the Baikonur Cosmodrome in Kazakhstan at 3:09 a.m. EDT. The climb to space appeared normal as the rocket thundered away through a clear blue sky and NASA's mission control commentator in Houston reported a normal separation from the booster's upper stage, along with deployment of the craft's two solar panels. But there was no confirmation its KURS rendezvous antennas had deployed or whether its propulsion system pressurized for upcoming rendezvous rocket firings. Telemetry indicating solar array deployment apparently was the last reliable data received from the spacecraft. Russian flight controllers near Moscow scrambled to command the ship "in the blind" during four successive passes over Russian ground stations in hopes of stabilizing the vehicle and preserving a chance to rendezvous with the space station. But there was no confirmation any of the commands were received or implemented. Docking originally was planned for today, but shortly after it became apparent the spacecraft was in trouble, flight controllers said they would instead fall back to a 34-orbit rendezvous scenario, setting up a docking Thursday if communications could be restored in time to begin a series of rendezvous rocket firings. But engineers were unable to establish two-way communications and NASA flight controllers said a Thursday docking was no longer possible. While it was not clear whether the Russians had any realistic chance of stabilizing the spacecraft, on-board video clearly showed the Progress was spinning, or tumbling in some fashion, with Earth rapidly wheeling in and out of the frame. If the spacecraft cannot be restored to normal operation, it eventually will re-enter the atmosphere and burn up. The Progress was loaded with 6,104 pounds of equipment and supplies, including 1,940 pounds of propellant, 110 pounds of oxygen, 926 pounds of water and 3,128 pounds of dry cargo, including food and clothing for the station crew. As of this writing, it's not clear what might have gone wrong with the cargo ship or even whether the spacecraft was in the planned orbit. Other than telemetry indicating solar panel deployment moments after reaching orbit, no reliable data has been received. "It was at that point that telemetry problems began to crop up as the Russian flight control team could not get firm confirmation of the deployment of navigational antennas or the repressurization of the manifolds in the propulsion system," said NASA commentator Rob Navias. That repressurization was required "to enable the Progress vehicle to begin executing a pre-programmed automated sequence of thruster firings that would have resulted in the Progress arriving at the International Space Station six hours after launch," Navias said. Instead, the flight control team fell back to a 34-orbit rendezvous scenario pending resolution of the communications issue. Just after 8 a.m., Navias relayed word from the Russian flight control team that the Progress was spinning in some unplanned fashion. the on-board video later confirmed that. Based on the rapid rotation seen in the video, it was not clear whether the spacecraft could be stabilized even if commanding was restored. The Russians do not operate a dedicated communications satellite network for Progress and Soyuz operations and troubleshooters must wait for the spacecraft to pass over Russian ground stations to uplink commands and receive telemetry. Commands were sent up during four post-launch fly overs, but there was no confirmation the commands were received. After the fourth pass, the cargo ship's orbit carried it beyond the reach of Russian ground stations and additional attempts to uplink commands were not expected until late Tuesday. "The latest ground station pass has come and gone with no luck by the Russian flight control team in receiving telemetry from the Progress 59 cargo craft," Navias reported. The Progress cargo ships and their Soyuz boosters are considered extremely reliable. The only outright failure of a Progress in the space station's 16-year lifetime came on Aug. 24, 2011, when a third stage propulsion system failure prevented a freighter from reaching orbit. Supplies also are delivered to the station aboard U.S. and Japanese cargo ships. But one of NASA's two contractors, Orbital Sciences Corp., suffered a catastrophic launch failure last October and flights of the company's Antares rocket and Cygnus cargo ship are on hold. In the wake of the Orbital failure, NASA was forced to modify its resupply strategy, reducing the amount of food and other critical consumables held in reserve as a hedge against launch problems. The station currently has enough supplies on board for at least four months of normal operation, and that doesn't include cargo carried up by Russian and Japanese freighters.